“Daddy when can we go camping again?” This is what our kids asked us as the weather started getting warmer and we worked on breaking the camper out of hibernation. Hallelujah! 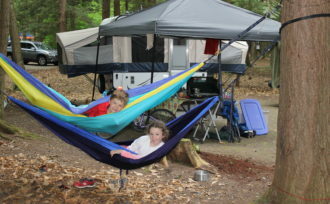 Our kids want to go camping! We’ve done something right! After what seemed like an extra long winter hiatus, our quest to reach all 55 Vermont state parks as a family began again Memorial Day weekend. Quechee State Park became #37 on our steadily growing checklist. It’s been a while since we’ve written about our state park quest because I don’t recall mentioning the fact that we graduated to a pop-up camper. And just when life and camping with kids was getting easier, we got a puppy. I guess we needed to balance out the relative “ease” of having a pop-up with the additional challenge of camping with kids and a dog! Proof that our kids have reached a somewhat easier stage, they took the campground map and jumped on their bikes to explore as we started cranking up the camper. We have rules and guidelines about this of course. “Tell us where you’re going, stay together, check back in soon, wear your helmets, etc,” but the fact that they can now ride around and make use of a simple map seems amazing to us! All our hard work is paying off. The kids have now also reached the point where they will sometimes “sleep in”. Mind you, “sleeping in” in our world is still only 7-8:00, but compared to 5:30, we’ll take it! However, our new puppy Webster is still an early riser. When Webster woke up at 4:00, Brian found the trail to the gorge and took him down there so the rest of us could sleep. Once we all were up, we took the hike down and spent most of our time that day enjoying fishing and hopping around on the rocks in the gorge. The pools of water were gorgeous (Ha! Pun not intended!) and inviting, tempting me to jump in. The water was too cold for me but the fishing was great, and the perch were biting for Collin and Brian. While they fished, Webster, Leah, and I had fun walking around on the rocks. Trying to navigate narrow bands of rock between rushing streams of water next to deep pools while holding an enthusiastic puppy on a leash and helping my daughter was somewhat challenging. I’m surprised I didn’t end up going for an unintentional swim, although that did happen to Webster at one point! In my experience, all Vermont State Park campgrounds are very well kept. We were impressed with the size of the sites, clean and nicer than usual bathrooms, and a big green space to play wiffle ball (an essential for our son, Collin). I will admit it was also nice to be in close proximity to some fun shops and stores with good food. All good camping trips must come to an end, and on our last day we packed up and headed down the road to VINS, Vermont Institute of Natural Science. I highly recommend this to anyone camping at Quechee. We got to see birds of prey up close, as well as learning about how birds are the descendants of dinosaurs. Although we’re on the quest to visit all 55 state parks, some are worth returning to over and over. We are excited to visit Quechee again someday and I would definitely vote for Quechee to be Park of the Year! See what you think! Take a look at Quechee State Park.